Alinafe was only a few months old when she first had malaria, which is a common cause of hearing loss in Malawi. 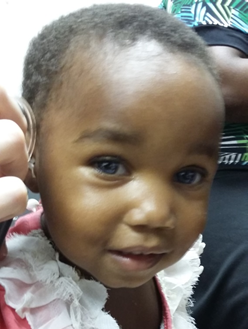 Her mother brought her to the hearing clinic when she was 2 years old, where she was identified with a hearing loss and glue ear. The option of grommets was discussed, however this required a 6-hour journey to Blantyre for the surgery, which the family could not afford. Alinafe did not return to the clinic for some time, due to the family being busy with subsistence farming. At the age of 4, repeat testing showed a severe hearing loss in both ears. Alinafe was fitted with second-hand pink Phonak hearing aids and enrolled in the Early Intervention (EI) programme we run for children under 6 who are newly diagnosed with a hearing loss. Alinafe is shy and the staff work hard to help her to feel relaxed in the clinic. 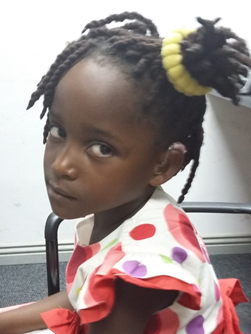 She has been wearing her right hearing aid regularly and her mother reports that she benefits significantly from wearing it, however until recently Alinafe repeatedly took off the left aid. On returning for a regular EI session, we checked the left hearing aid and discovered an intermittent fault. Alinafe was fitted with a replacement aid which she appeared very happy with. Regular attendance at the hearing clinic for support with developing listening skills and routine audiology check-ups helps us to identify and manage problems early. Tiyamika, is 23 months old and first came to our clinic two months ago. She has a severe-profound hearing loss in both ears. Although she cannot speak yet, she is a very communicative little girl. Her striking blue eyes suggest to us that she has Waadenburg’s syndrome, although this has not been officially diagnosed. Two weeks ago Tiyamika was fitted with a second-hand Phonak hearing aid, and is already asking her mother to help her put it on in the morning. She is now entering our Early Intervention programme, in addition to receiving communication support from a local rehabilitation centre. Tiyamika is learning to imitate the speech sounds she hears, she is a delight to work with. Most of our hearing aids and equipment are donated, and keeping appropriate levels of stock is a constant challenge. One of our biggest issues at the moment is acquiring tamperproof battery drawers for hearing aid fittings for young children. We create our own by filing down the hearing aids so that they are very difficult to open. It works, but it’s not ideal! 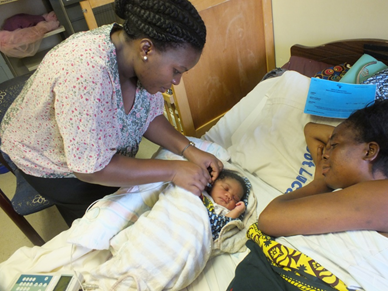 Our clinic is linked to a small maternity hospital and in December we launched the first hospital-wide newborn hearing screening programme in Malawi. The programme has been very well received, and we are now running a pilot project offering screening to newborns coming to the community vaccination clinics, and also for high-risk babies in the special care unit at the local government-run maternity hospital. One of the biggest difficulties we have is following up babies who require repeat screening. Often families have no phone and so many are lost to follow up. For babies with no clear response from the screening test, we offer diagnostic auditory brainstem response (ABR) testing at the hearing clinic. This testing comes with many challenges, the clinic is very hot and we have never yet completed an ABR without at least one power cut, but we work around these difficulties. The African Bible College Hearing Clinic and Training Centre in Lilongwe is unusual in offering newborn hearing screening and diagnostic testing, hearing aid fittings to infants and an Early Intervention programme for young children with hearing loss to develop their listening skills. Having all of these services available in the same centre provides an easily accessible service for children and their families.